By Luis Bueno – RIVERSIDE, CA (Jul 4, 2018) US Soccer Players - Like most other parts of the country, Southern California's focus is on the World Cup. Ratings have been consistently high locally. Everywhere anybody turns there is talk of soccer, whether it is on social media, gatherings at work, or with friends and family. Soccer has been on the forefront and it seems like both the LA Galaxy and LAFC would stand to benefit in the long run. Then, the soccer community got a reminder of just what kind of town this is and what the long-term battle for attention really means. LeBron James arrived and the NBA’s Los Angeles Lakers suddenly became relevant again. News coverage that focused on the happenings in Russia turned its attention to a league that will not start playing again until October. Social media posts now featured James in Laker gear. The Lakers logo was suddenly everywhere. Sports in Southern California had briefly made way for James and the Lakers. Mexico’s Round of 16 match against Brazil captivated the region once again the day after James’ signing. Now that Mexico is out, the James frenzy is in full effect. For the Galaxy and LAFC, competing in the Los Angeles market is and, at least for the Galaxy, always has been difficult. The long-established sports teams have history and tradition behind them, and with that the attention of the City of Angels. The Lakers’ demise and the Clippers’ inability to generate the same levels of excitement had taken at least one major competitor down a notch. James’ arrival signals to the Galaxy and LAFC one thing - Los Angeles belongs to the Lakers. Not the Dodgers or the Clippers or the Kings. Not the Rams or Chargers, UCLA, or USC. Certainly not MLS or soccer for that matter. This town belongs to the purple-and-gold, plain and simple. Knowing that, though, is important for both the Galaxy and LAFC. Both MLS clubs are fully aware that in order to become a relevant part of the LA sports community, they need to showcase their goods. For the Galaxy, those goods include competing for championships and bringing in big-name players. Zlatan Ibrahimovic has helped the club keep its own promise of always featuring world-renowned stars. 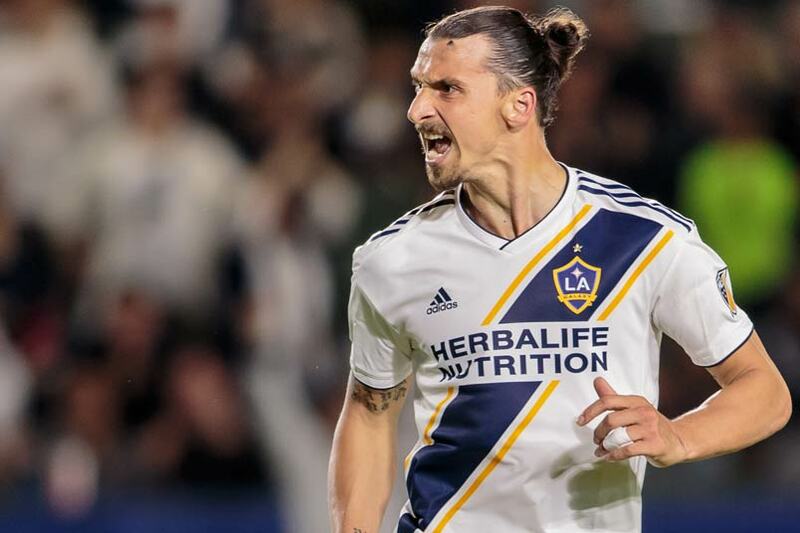 Whether Ibrahimovic helps the club compete for MLS championships is a different story. At the team’s current rate that does not seem likely. That's also not Ibrahimovic’s fault. He had a brace in the Galaxy’s 3-3 draw at San Jose on Saturday and has scored nine goals in 12 games since moving to MLS. At that pace, Ibrahimovic is likely to finish at or near the top of the goal-scoring leaders in the league at season’s end. LAFC meanwhile may not exist if it wasn't for the same forces that helped bring James to the Lakers. People want to be here. Former Laker legend Magic Johnson is one of LAFC’s owners and helped play a role in not only bringing the club to existence but helping build the wonderful Banc of California Stadium as well as filling the roster with the likes of Carlos Vela, Benny Feilhaber, Laurent Ciman, and coach Bob Bradley. LAFC also dropped money on lesser-known players like Diego Rossi and Adama Diomande, who have combined for 12 goals this season. LAFC has been rather successful in its first season, with a 9-4-4 record following a 2-2 draw with Houston on Tuesday to open up the month of July. One point off the Western Conference lead is not bad for an expansion team and likely higher than many had predicted before the year started. LAFC also win with flair, as the club leads the Western Conference in goals scored with 37 and one behind Atlanta for the league lead in that category. All that is well and good but in the eyes of the general public, only one thing though will make this a successful season for either the Galaxy or LAFC - a championship. By the time the Galaxy and LAFC close out the regular season, on October 28, LA will have plenty of sports options. The Rams host the Green Bay Packers that day in what likely will be a sellout crowd at the LA Coliseum. The Chargers have a bye week but will be seven games into their season. If the Dodgers are still alive, they will be nearing the World Series. Both UCLA and USC football will be in full swing. The Lakers though will surely top all other stories because the LeBron James Era will have officially gotten underway in the city. The Lakers have been terrible for five years running, with the team last reaching the postseason in 2013. The last time the Lakers won the NBA Finals was in 2010, when the club won its second consecutive championship and fifth in an 11-season span. Fans are thirsty for meaningful games, for a return shot at glory. Already there is talk of a championship run. Will this team battle against reigning champions the Golden State Warriors and end up in a playoff series against them? Will they push the Clippers into irrelevance, winning a local derby that may end up mattering more than the other sports? Will James join the list of Lakers legends leading the team to a title? The Lakers will take over. Right now, anything the Galaxy and LAFC can do before then to stay relevant in Los Angeles will be a major league win.